Before we move on, let me give you a little headsup – I’m having some tech work done on my blog throughout this week, so please let me know if anything doesn’t act quite right for you. 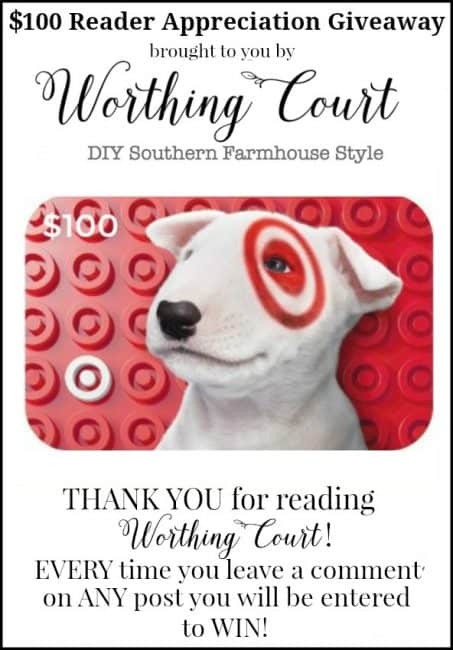 For each month’s Reader Appreciation giveaway, I’ve been rotating between Visa, Magnolia Market, Pottery Barn and Amazon egift cards. This month I’m adding Target to the mix! Who doesn’t love Target??? SCROLL TO THE BOTTOM FOR ALL OF THE GIVEAWAY RULES AND TO ENTER! If you follow Worthing Court on Facebook (if you don’t already, you can do that by clicking right HERE), then you already know that we purchased a new-to-us condo at the beach last month! We sold our previous teeny-tiny condo and purchased a larger one with two bedrooms/two bathrooms. This is such an exciting thing for us as we’re anticipating being able to visit the beach as a family and create lots of memories! This condo needs a total cosmetic overhaul, so my mind and my time have been consumed with all things makeover! I’ll be keeping you updated along the way with blog posts and with live videos on the Worthing Court Facebook page. In spite of my pre-occupied mind, I did manage to start preparing for fall and to accomplish a few things in August though. Take a look. I FOUND THE BEST FALL THROW PILLOW COVERS FOR UNDER $30! 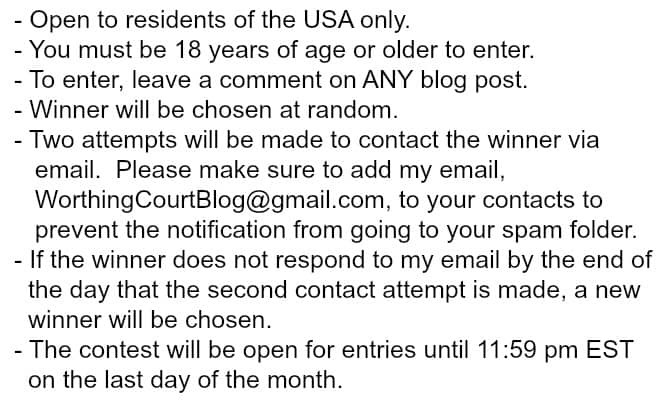 MAKE SURE YOU READ THESE RULES FOR THE READER APPRECIATION GIVEAWAY. So glad I found your blog. Looking lorfawd to lots of inspiration. Congratulations on your new condo! Thank you for ALL your fall deco ideas. I am inspired for a great fall time, including family memories! I’m new to your blog. Looking forward to all the wonderful inspiration for the upcoming Fall Season. Make-over…I’m always interested in seeing the transformation take place from what was to the endless possibilities leading to the completion. Can’t wait to see what you have in store for your new Condo. Congratulations! Love the copper brought in for the fall. Such a pretty soft color. Love the door wreath. Thanks, for all the inspiration. Just toured your beach condo redo, and >>>NO SURPRISE>>>it was beautiful. Love, Love, Love your blog! Looking forward to what’s next. I love, love, love the fall planter. I really enjoy decorating for Fall, but have a hard time with quick and not too expensive wreaths. So I was glad to review your post on ” Easy Wreaths”. Thanks for the inspiration! Thanks for the wreath inspiration. Now I just need to create one of my own. Love your planters too. Enjoy your Monday. Love your fall planter ideas. I am planning on using them on my front porch. still trying to gather the materials needed to make the fall planter. Hoping HL will have their fall stuff 50% off. Saw your video on your new condo. Wow! Can’t wait to see what you do with it. I’m sure you already have a vision working! Thanks for your gift card giveaways, have not won yet, but I hope to soon. You have such a talent for decorating – always enjoy your inspiring posts! Look forward to reading your blog each time it arrives in my inbox! Thanks for all the great ideas you give us! Love reading your blog! Thanks for all the great ideas. Found your blog and love it. Love Your Blog!!! So Many Besutiful Ideas!!! Thanks for the give away – Hope I win!!! Congrats on new beach home! 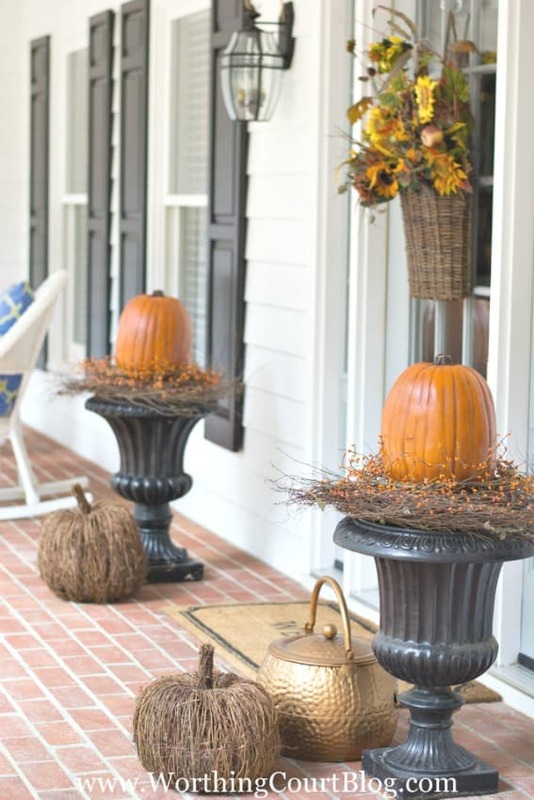 Love the fall look on the porch! I’m going to try the urns with the pumpkins! I love decorating for Fall. The colors of Fall are my favorite. Thanks for the inspiration. Love your Fall Entry into the house. You have great taste in all you do! Loved seeing your blog on the new to you beach condo! Cannot wait to see what beauty your impart! And what super family memories you’ll make. Fortunate indeed. On to fall decor now!! Congrats on your new Condo!! I’m sure your family is going to make many good memories there!! I have really loved your easy wreath inspirations. Autumn is my favorite season and so fun to decorate for. Your fall posts are so pretty but it’s hard for me to think “fall” when it’s going to be in the mid-90’s today! I did walk through a pile of leaves this morning so at least some of the trees know it’s fall! Thank you for the inspiration. Congratulations on your new condo. Best wishes wit the new condo….how fun to be able to fix it up for your family! Looking forward to all of your fall decorations fir inspiration. The condo refo is lovely! I loved what you did with that tiny condo, the bunk beds in the hall. It doesn’t make sense for me to buy a large condo for the occasional guest I would have and your changes really maximized the square footage. I am loving the cooper color for Fall decors. Congrats on your new condo. Thank you for the Fall inspiration. Love all the fall ideas! Thanks! Hope your condo has been spared by this Hurricane Irma! Wishing you the best on your new remodel. Can’t wait to see the pics! Thanks for sharing all your wonderful ideas !!! Love all the burgundy fall pillows and congrats on your new condo purchase! I really enjoy your blog and your decorating style. Thanks for the easy fall planter ideas. I dug into my stash and….mission accomplished. Easy peasy! Beautiful as all ways! I know I can always see something fresh. Love your decor ideas! Beautiful and easy to reproduce. Thanks! Love your decorating tips. I can’t wait to see your beach condo renovations. I love following your blog and I love the way that your ideas are actually doable! Thank you for all the inspiration. I really love your decor and look forward to your blog. Yes, September is almost gone! I am anxiously waiting the end-of-year holidays with family. Love your blog! I send my decorating pictures to my daughter in Michigan, she is the one who told me about you. Amazing fall ideas! I am going to make the door basket today. So much inspiration as always!! Thank you for all you do. My son and family just moved after Hurricane Harvey and we’ve used soooo many of your pics for ideas. And I’ve used fall decorating ideas for my home. Love your blog! and the decor is always great. I made my fall planter like yours yesterday and I love it! Thank you for the generous giveaway! This is my first visit and definitely not my last. 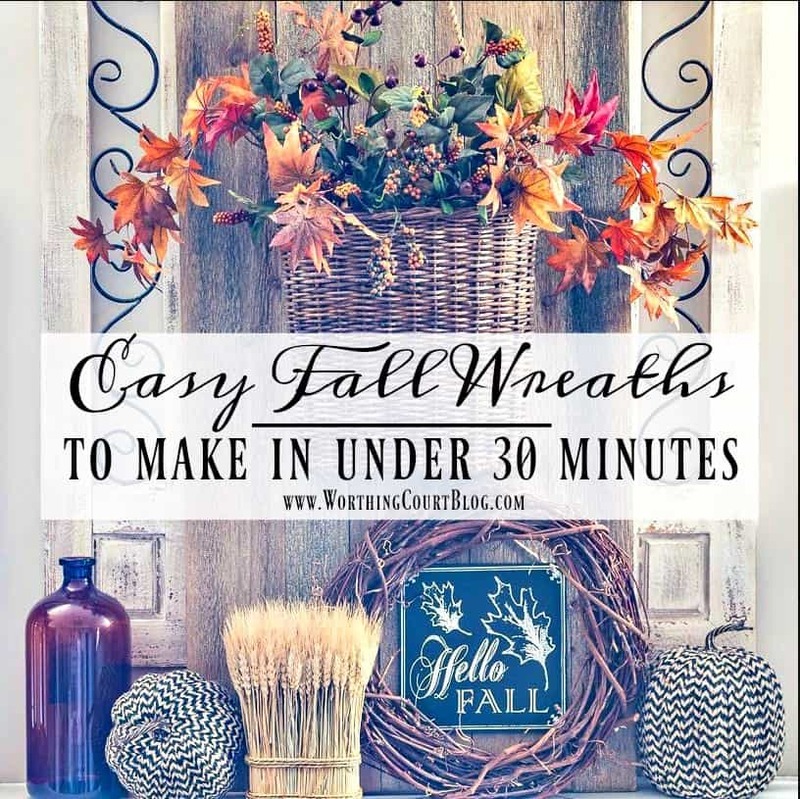 Love your blog on wreaths in 30 minutes or less. What could possibly be more fun than a beach condo renovation! Looking forward to seeing photos! I really enjoy your blog and your style of decorating. Love your blog! I’m going to attempt to make your fall planters. I’ve already spray painted my planters (they were already black, but needed touching up) and today I’m off to find the other materials. I love the Fall Tours. Your monthly giveaways are great! We’ve been using your blog as a model for re-dong our living and dining rooms. Today we are tackling the buffalo check chair pads and benches for the dining room. Here we go! Thanks so much! Love your style. Thanks for sharing all your wonderful ideas. Just love the pillow collection you’ve shown us for fall inspiration! I like the urns outside on the porch with the berry wreaths and pumpkins. What an easy way to decorate for fall! Hope I’m the winner of the Target gift card. Thanks for doing this. Congrats on the beach house, more decorating! Hooray!! I love your blog and style of decorating; makes me smile every day to see what is next. Enjoy reading all your blogs. I am an avid Pinterest fan and repin many, many of your photos. Thank you for the easy wreath ideas. I need the inspiration and you always have great ideas. Budget friendly as well. Thanks so much ! Love all the fall color choices…..love your porch…..good luck on your new condo…how fun!!!! Love your decorating style and would also love to win the “giveaway”! Great ideas and blog…keep it up! Your fall porch is beautiful! Where did you get your rattan basket that is on your front door? Thanks so much! Hi Pam. Thank you! That basket came from World Market. Love your blog. It’s elegant and you can still learn things. Thank you! I especially love the Fall pillow covers! Congrats on the condo! I’m so envious. And I love the fall throw pillows. A lady can never have enough of them (just ask my husband)! You are my favorite blogger…love your style of decorating as it is so pleasing to the eye and easy. Great ideas, and clever use . I always love seeing your seasonal decor. I am a new reader of your blog and love the look as well as the posts. Thanks for having a reader appreciation giveaway! Love the front porch for Fall! Stunning!! I love your decorating ideas. Thank you. Thank you so much for the ideas and the confidence to try them. Love your sight! Getting ready to redo master bedroom and thanks to your blog decided I LOVE the Fsrmhouse look! Thank you! I love the fall ideas! Love your ideas and decor! Excited to see what you share! I think your plaid pumpkin and plates are the best! I’m on a mission to find something similar! I just love that look!! I rarely go into Kirklands. All the strong sachet smells give me an instant headache and sneeze attacks. However, after reading your blog for a while and seeing how you use some beautiful Kirklands merchandise…..I have to shop there today. I will power through the sachets. I love the new lamp and have always loved the arch over the fireplace. You are so inspirational to me. Love all your fall decor ideas!! So inspiring!! Love your blog….so much inspiration! thanks for the fall tips already used one on my porch! It’s hard to think fall when it’s 90 degrees in Ohio. Your ideas are an inspiration! Love your blog, Suzy. Look forward to reading it everyday. You made my day by showing the idea for your planters. I have some similar and wondered what in the world would I do with them and voila, here you are . Thanks so much for the inspiration! Beautiful greetings for fall. Well done! Congratulations on you cond purchase. Will be looking forward to your updates to your new place. I love your fall decor and inspirations! Can’t wait to get myself in gear and implement some of yiur ideas. Thanks again for another opportunity to win a gift card! Love your blog! Always look forward to your inspiring ideas. I am happy to copy them. Thanks ! I copied your fall planter idea. I purchase all 4 of my grape vine wreaths at my local Michael’s store for $5 each and then had a 20% coupon along with orange berries. My pumpkins are 2 different sizes (one is a little smaller than the other but aren’t most pumpkins anyway). I must say it took me last than 5 minutes and looks so beautiful. Please share other ideas that are quick, cost contained and look marvelous. Good luck on your new condo. I am looking forward to seeing before and after picks. Your blog always a great inspiration. I am new to sending reply but I am NOT too old to learn new things (especially for the chance at at $100 gift card to Target!) Have enjoyed your blog but yes it did first go to my spam file! Glad I found it and now it comes to ME! HAPPY FALL and how exciting to have a new (and bigger) condo for a project! Just found your blog recently and am enjoying your decorating ideas immensely! Keep them coming! Thanks for all the wonderful fall tips. I have finished my wreath, decorated my porch, and KISSED my home with subtle fall accents. Now to decorate for a dinner party of 150 on Thursday. Oh well, a woman’s work is never done!! I really am enjoying your blog? So many ideas and inspiration! Keep it coming. I love these great Fall ideas! I always enjoy your blog, Suzy. Thanks so much for all the beautiful ideas.